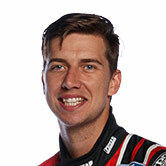 Chaz Mostert has delivered the first blow in qualifying, leaving co-driver Steve Owen to start from pole position in the first of the qualifying races at Sandown. The unique format means that even though Mostert topped the session with his 1min08.6147, he’s only completed one part of the task. The co-drivers will race for 60km to set a grid for a main drivers’ race, which will determine ARMOR ALL Pole Position. Mostert’s retro Supercheap Auto Racing Falcon popped up the order with less than five seconds remaining in the session, topping Jamie Whincup by 0.0084sec. “That was seriously hard ... I had to dig deep in that last one,” Mostert said. He and Steve Owen are paired up for the first time in this year’s Pirtek Enduro Cup – the man who won the Sandown 500 with Mark Winterbottom will start on the front row with Paul Dumbrell alongside. “I’m a little bit surprised to be honest, we’ve been working away on the car,” Owen said. Fabian Coulthard, Garth Tander and James Moffat completed the top five, mixing up the order at the front. Championship contenders Shane van Gisbergen, Mark Winterbottom and Craig Lowndes are further back than some would expect, with the Red Bull Commodore to start from ninth, The Bottle-O Falcon 11th and the TeamVortex Commodore starting from 14th. After an engine change after practice, Todd Kelly’s Nissan left the garage mid-way through the 20-minute session to finish 25th. 10. Dean Fiore – Nissan Motorsport.